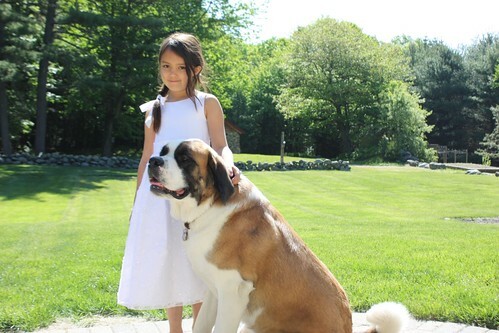 A couple of weeks ago, our first born Critter took first communion. I'm not terribly Catholic - in fact, I'm not at all Catholic, but when I asked my Bride to marry me, I kind of had to take a crash course in the whole Papal domain. I was raised Presbyterian (by my Father, The Surgeon), who was rarely openly religious or even very regular in his church attendance. I do, however, remember being in very deep trouble when I hit someplace along the 10 or 11 age range and decided that I wanted to sleep in, rather than get up and go to service on a day he decided We Were Going To Church. 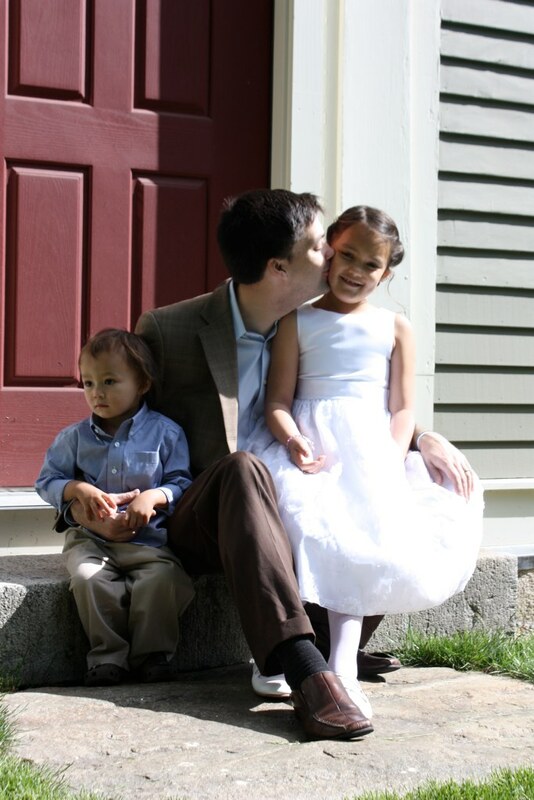 I recall a couple of periods in my childhood where church became a Big Deal in our house. I think we went for a solid year to one of the first larger 'non-denominational' churches on the outskirts of Atlanta. I can't remember the name of the church, but I do remember we passed a Levitz furniture store on the way too and from each Sunday. It had a big sign. The church should maybe have had a bigger sign. I also remember we all got re-baptized at that church. It was a Saturday, and the church was shockingly and unusually empty - I had never seen it as anything other than full of hundreds of people. Just the pastor, my parents and I. And this was the full on dunking, not the half-hearted Presbyterian sprinkle on the forehead. At the end, I was presented a Bible with my name inscribed in gold leaf on the cover. Which I still have, along with a collection of other Bibles, a copy of the Apocrypha, a Book of Mormon, and a Koran. (color me curious). About a year or so later, my parents got divorced. Huh. Looking back on that, there may have been some "the family that prays together stays together" action there. I remember mostly my Picture Bible, though. It was like a huge comic book, except with Jesus as Spiderman. Or maybe Iron Man. Well - for the New Testament. In the Old Testament, Moses was more like the Incredible Hulk. Less green, but plenty of 'Hey Pharoah, you won't like me when I'm angry' action. This was some seriously riveting stuff for an 8 year old, with loads of the Smiting action. I tried to find a copy of that for the Critter, but with little luck. For you Catholics in the audience, it may surprise you to know that most other churches don't hand out play-by-play programs in the pews, with the selected readings and psalms pre-written in paint-by-number formats. We just mostly got a bible and an occasional pointer from the preacher. All through high school, I dated a girl who went to the Church of Christ (a little more aggressively Protestant than most, and far more so than the sedate and urbane come-as-you-are Presbyterian church I was raised in), where Preacher Dave might jump from Revelations to Exodus to Luke to maybe a little bit of The Letter of Saint Reagan to The Corinthians in the same sermon, and you were expected to keep up, flipping furiously through your handy copy to the quoted copy. My girlfriend and her family were more religious than most, and I was in love and willing to do most anything to impress, probably attending more services in those couple of years than I have attended before or since, combined. To find ways to pass the time, I probably read the actual non-picture Bible two or three times, cover to cover in those Sundays. When I first started going to Catholic church after getting married, I was as impressed by the ceremony and the ritual as I was perplexed by the uniformity. Compared to us enthusiastic but naive Protestants, these Catholics have this service thing nailed down to a science. Over the first few years we attended Mass in California, Texas, Ireland and Georgia. They all had the exact same little books, with the exact same prescribed readings, in the exact same order. As a Catholic, you can walk into any Catholic church in the world, whatever the language, and know exactly when to stand up, kneel, cross yourself, or throw money in the pot. After two thousand years, they pretty much have it down to a science. In fact, the only exception I ever saw was at a Mass in Kilkenny, Ireland, during the World Cup quarter finals. (For us non-Europeans: that's Soccer). The priest basically said we're gonna sing one song, read the part from the Gospels, offer communion, and then we're out of here. Bing, Bam, Boom, See you all next week. Loved it. Generally speaking I go along with most of it, without crossing myself, taking communion (they politely ask me not to, as a non-Catholic) or saying the various creeds. I'm faithful, without being religious. But I always, always give the hugs. And then everyone reaches over and shakes hands (or hugs, if you're feeling extra friendly), greets one another, and says 'peace be with you.' How great is that? Who couldn't use some more of that in your day? Seriously. I think we should all try and do this at least once a day, Mass or no. "Hey buddy. You there on the corner. Yeah, you looking all frowny. Peace be with you. Now come here and give me a hug." I challenge you to try this tomorrow, and see if it doesn't leave you smiling. If you manage to catch the right Mass, there's an old guy who walks up and down the aisle, shaking every one's hand in the audience, determined to make sure he doesn't leave anybody out. You'll know the one. He probably bought that suit sometime in the late '70's, with the unnaturally shiny-yet-uncomfortable fabric. He might be your uncle-in-law. Forget all the comforting ritual and routine. I love this part. It's the part I go for. It's the part I wait through the rest of the Mass for (and they put it near the end on purpose, I'm sure of it.) It's the most neighborly thing going, and we Protestants don't have anything to compare. I'm going to be that guy in the '70's suit one day. And you're all going to have to wait for me to go up and down the aisle, determined not to leave anyone out. As for the Critter, she got through her Communion just fine. Well. Mostly. She was actually sick the day of Communion. It was a Saturday, and she woke up hurling chunks at about 5am. 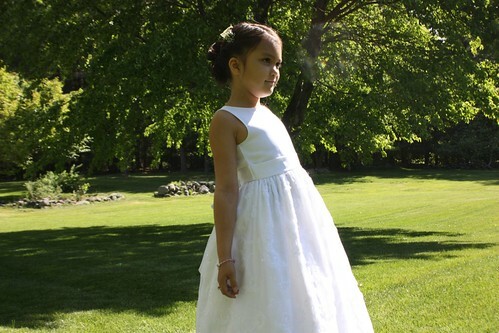 She vomited a couple more times that morning, but was so excited about getting to wear her new First Communion dress that she begged us to let her go. 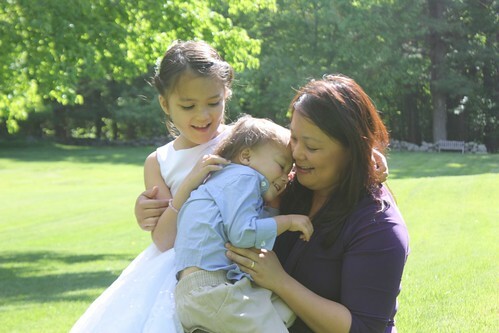 She swore she'd be ok.
She threw up two more times at church before they began the processional of all the kids that had been preparing for weeks to receive Communion, but promised she'd be alright. If only we'd let her walk in during the processional. She looked green as clover (which given her half islander heritage, is hard to do), and the whole time I sat in the back thinking, "Please don't throw up baby Jesus on the priest. Please don't throw up baby Jesus on the priest." In the back of my head were flashing scenes from The Omen, where Damien had violent & painful reactions from being dragged into a church. Uh-oh. What if that birthmark didn't really say "999"? Fortunately, she made it through the procession, and to the pew, but had to head one more time for the porcelain receptacle. Which spelled the end of the Communion day for the Critter. The priests (being priests) were exceptionally kind and solicitous, and made a huge deal out of her. 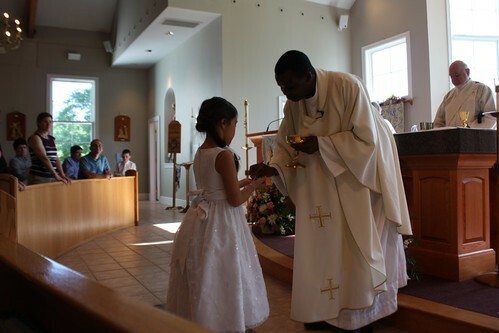 We came back the next day for normal Mass, and she got special attention and the opportunity to take her communion in front of the normal crowd. And I'm proud to say, she didn't throw up on the priest.